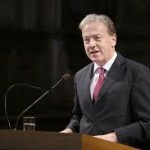 Irish Ambassador to the European Union Tom Hanney is in the throes of a six month stint at the heart of decision making in Brussels, as Ireland currently holds the EU Presidency. The Deputy Permanent Representative says holding the Presidency is “a marathon, from January to June”. We met him to find out about Irish commitments to wind energy and why they have given so much support to Global Wind Day this year. What motivated the Irish Presidency of the EU to support Global Wind Day 2013? From a national point of view, wind energy is very important to Ireland. In the Irish government’s Renewable Energy Strategy, wind is identified as a key resource. We have a lot of wind sweeping over the country given our geographical location. An increasing amount of our energy is produced from wind. We are committed to reaching our renewable energy targets under EU energy policy and we will be a net wind exporter. Overall, wind is a very important resource for Ireland and an increasing one, so therefore we support Global Wind Day. Ireland is not on track for EU emissions targets and the reductions, but is well on track for our 20:20:20 commitment – that 20% of your energy has to be produced from renewable energy sources by 2020. We are at around 18% at the moment. Do you think the EU needs 2030 renewable energy targets, similar to the 2020 targets? In Ireland we would be very keen to have 2030 targets. The energy industry plans on a very long time-scale, so industry needs to know what the strategy is and what the targets are, well in advance. Already, in Europe and in Ireland, industry wants to know whether there are specific emissions targets, renewables targets or energy efficiency targets for 2030. At an EU Environment Ministers meeting in Dublin this month, ministers broadly did agree that yes, there will be a need. The debate seems to hinge on whether we need three or four targets, or just one target. Some countries are of the opinion that we have too many targets in Europe, and they don’t always cohere, that they conflict with one another, and that we might be better off with one target. That whole debate is happening at the moment. We expect a Commission proposal by the end of the year. How do you see the energy mix in Europe in ten years’ time? We will be looking at the energy issue, primarily from a competitive perspective. The Commission is of the view, and the general policy trend is, that if we manage to achieve the targets and objectives of the internal energy market, in terms of interconnections between the different grids, if we introduce more competition into the EU energy market, and we achieve unbundling between the generators and networks, all this will lead to a much more efficient, integrated energy market in Europe. At the moment we have a fragmented one, and a fragmented one is much more expensive. What has crept into the whole debate is what we call unconventional carbons or fuels in the US – principally shale gas and the dramatic reduction in the cost of energy in the US, while at the same time in Europe energy costs have been creeping up, putting us at a considerable disadvantage. It also has the peculiar effect of the US generating so much of its energy from shale gas that it has a huge coal surplus that is being exported to Europe, and being burnt. So, even though Europe has a very environmentally friendly energy policy, we are now building more coal fired powered stations and carbon emissions are beginning to creep up. Europe’s approach to the whole shale gas issue was discussed in Dublin – there are very divergent views. Poland or the UK have already indicated that they will develop their shale gas deposits, and have put in place a framework. Others like Austria are advocating a ban. A lot of member states would like the Commission to come forward with, not a harmonised regulatory approach, but simply some sort of guidance on how best to go about it. There is a view that the issue should be left to national discretion, but at the same time there is a view that we should all be roughly operating on the same principles, using the same science. I think the Commission will go down that road. So, in addition to all this interconnection, over the next few years, and efforts to have an interconnected market, this whole shale gas issue will become an increasing factor. So far it hasn’t been factored into the overall policy framework, so we will have to see where we go with that one. What do you think of the recent agreement between Ireland and the UK to trade in wind produced electricity – is it a model for future agreements in Europe? It generated considerable interest in the Commission as it is a somewhat unique situation and will provide a template for similar schemes in the future, so there was a great deal of consultation with the Commission because the arrangement we come to with the UK will have to be based on EU law. We were trying to make sure that the Commission was also comfortable with what we were doing. They do see it as paving the way for similar schemes elsewhere. Under the energy infrastructure package that was agreed at the end of the Cyprus EU Presidency, Europe will end up funding “projects of common interest” and one the biggest is this huge wind farm in the North Sea. That should in turn result in exports of wind energy, between countries, so a whole framework has to be put in place before this. The deal has been the subject of some controversy in Ireland. There are issues surrounding noise, location, and visual impact, but on the other hand there are enormous benefits, including for local populations, and we have to make sure that there is a proper dialogue with them and that all of these wind farms are developed in accordance with EU planning laws. If you manage to include the public at an early stage, and consult them and inform them, it makes things easier, but the issue of public acceptance is vital.